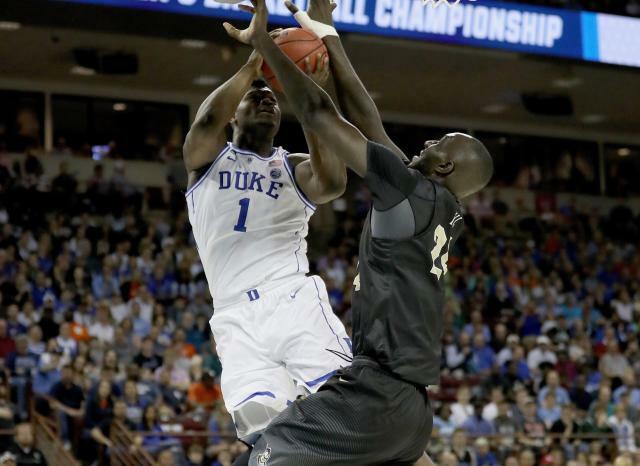 Much was made of the anticipated battle at the rim between Duke superstar Zion Williamson and 7-6 UCF center Tacko Fall ahead of Sunday’s second-round NCAA tournament matchup. So far, the two have delivered on that promise. After winning his 33rd opening tip in 33 games this season, Fall quickly put on display the dilemma his size presents for opposing defenses. After seeing his opening hook shot bounce off the rim, Fall casually grabbed the rebound over a pair of Duke defenders for an easy one-handed slam to give the Knights the first bucket of the game. While all eyes were on the post matchup, Williamson opened the game by showing off his range. The first Duke bucket of the game came courtesy of a Williamson 3-pointer. Williamson worked early to get his post game going, a topic of much discussion after Fall vowed to not allow Williamson to dunk on him, a promise that Las Vegas picked up on by offering odds on whether Zion could put a poster on UCF’s towering center. Fall lived up to his promise on Williamson’s first effort. And he made the Blue Devils pay on the other end. But while they might not count for Vegas prop bets, Williamson dunks that aren’t on Fall still count in the box score. And Zion got in a good one late in the first half, showing off his remarkable athleticism to snag a pass from R.J. Barrett before flushing it home. Of course, Fall was on the bench for that one. The matchup lived up to expectations in the first half with TCU giving Duke a surprisingly competitive game. The Knights held a 34-32 lead before the Blue Devils closed the half on a run to take a 44-36 edge into halftime. Williamson led the way for Duke in the half with 15 points, 4 rebounds and 3 assists. Fall, meanwhile, tallied 7 points and 3 rebounds.